« What does mobile gaming have to do with saving mountain gorillas? This compact MP3 player can hold 2000 of your favorite songs. You can even add more external memory with a MicroSD Transflash Card. The e280 plays MP3, WAV, WMA and ASF audio files. 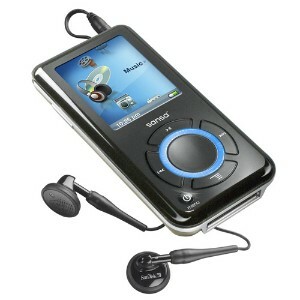 Unlike most other MP3 players, it also plays MPEG-4, MPEG-1, MPEG-2, WMV and AVI video files. The 1.8 inch screen is bright and displays the unique Sansa interface nicely. Cool features include FM Stereo Tuner, Voice Recorder, Radio Recorder and Built-In Card Reader. The Rechargeable Lithium Battery lasts for 20 hours when full charged, giving this media player, excellent battery life. The sound quality is clear, just like an iPod, just without the price tag. The 2280 is very affordable, and is cheaper than any iPod. It also has a lock button, to avoid accidentally changing your playback. Durability is a plus on this device, since it’s built solid. The interface is simple and upfront. From a Gadget Addicts perspective, this mp3 player is an excellent choice if your looking for an MP3 player. The interface is different, so it will take some getting used too. The screen is going to get scratched if you don’t take good care of it, but if your at all careful, you’ll be alright. Also, the earphone that are included, aren’t exactly top quality. It seems like all you need to do, upon your purchasing your device, is to buy a sleeve for protection and earphones. Overall, I would choose the Sansa e280, over an iPod, any day. I should like to buy this MP3 player. I live in Roumania , Cluj Napoca , how much cost this player ? May I buy even from Roumania ? Cluj Napoca, my city , where I live ? This is actually one of the best mp3 players i’ve ever had, every mp3 player i had lasted me less than 6 months cause i drop it so often, this one its been like 2 years now. Its got scratches, the screen is broken, the screws on the back are missing but the functionality is still as good as when I bought it.